After more than a decade operating with Rototilts, Pete Stroeder Contracting Inc knows Rototilt and its wide range of tools boost on-site efficiency and deliver a higher quality product for golf course owners and homeowners. “I really believe if you don’t have a Rototilt today, you’re going to need one to remain competitive.” Pete Stroeder, owner, Pete Stroeder Contracting Inc.
“It would have been almost impossible to get my foot in the door (during a recession and in a new market) without the Rototilt. That’s what set me apart from every other operator looking for work. Once people saw it and saw what I could do with it, I was kept very busy, and every company I worked with instantly tried to copy what I was doing.” Pete Stroeder, owner, Pete Stroeder Contracting Inc. “I’ve never waited for the big guys to adopt new toys. 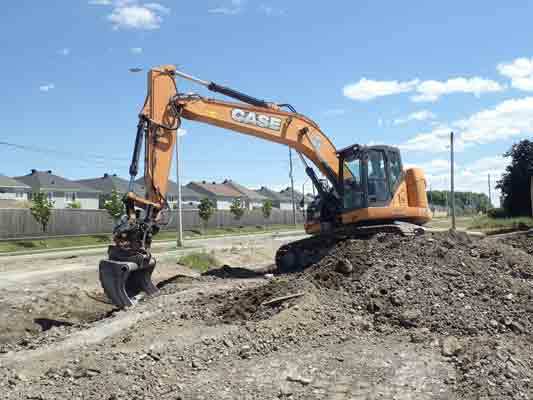 In this business you have to be willing to take chances and test out new tools because, like the Rototilt, they can change your business in an amazing way.” Pete Stroeder, owner, Pete Stroeder Contracting Inc.
“I bring to the table a lot of different attachments to my jobs. With the Rototilt, I’m always thinking about new ways to use it to save me time, be more effective and deliver a better product.” Pete Stroeder, owner, Pete Stroeder Contracting Inc. Since 2001, Pete Stroeder Contracting Inc. has taken on challenging projects to practically and efficiently turn a client’s vision into reality. The company brings leading-edge tools and technology with a highly experienced team capable of turning bush lots into the landscaped properties of a client’s dreams or shaping bunkers and fairways into award-winning golf courses. With a wide range of attachments, a Rototilt lets operators use a single machine for 35% more tasks. After more than a decade and more than 22,000 hours running excavators equipped with a Rototilt®, one thing is certain: Pete Stroeder Contracting depends on Rototilt to deliver in his niche of tackling tough projects with creative ideas and strategies to turn vision into reality. Stroeder saw his first Rototilt while he was living in Orangeville but never saw it operating. After moving to Kamloops to build Tobiano Golf Course in 2006, he was in the market for a new excavator to move from an 11-ton to a 20-ton machine. He decided the time was right for a Rototilt. “After I first saw it, I started thinking about what I could do with it and it expanded from there.” He bought a Volvo 210 from Great West Equipment and while they had no experience with Rototilt at that time, they made all the arrangements. Since that first Rototilt-equipped excavator, Pete Stroeder Contracting has continued to regularly upgrade its fleet and its Rototilts, which he uses for all his landscaping and shaping projects. Today, the fleet includes a Case 235 with a Rototilt R6 and a Case 75 with Rototilt R3, as well as a Volvo 240 for land clearing, and a John Deere 323 Skid steer. When the Volvo 210 with a Rototilt RT60 was delivered to Kamloops’ Tobiano Golf Course, everything changed for Stroeder. After using a wrist for more than 10 years, the Rototilt took excavation and shaping from two dimensions to three dimensions, which was a game changer. When putting in a bunker complex, Stroeder says a Rototilt-equipped excavator will shave 30 to 40% off the shaping time, which when you’re looking at the short golf course construction season, means you can get it completed faster. In the past, Stroeder relied on a manual quick coupler to change attachments but the Rototilt Hydraulic Quick Connection, called QuickChange™ makes using his wide range of attachments quick and easy. Where manual quick couplers could take up to 10 minutes to change over from one attachment to the next, he can move from the G bucket to trenching bucket to clean up blade in five seconds. “I’m known for having the tools to do the job,” says Stroeder who has bought or designed a wide range of tools including G buckets and tooth buckets, the 10-foot blade, combination digging and finishing buckets, frost picks, and a universal quick coupler so that he can use all his skid steer attachments including a grapple bucket and forks. He’s currently looking at a screening bucket to provide additional services when backfilling around trenches or homes, but that’s not the last tool he’ll add. As Stroeder realized 10 years ago, the possibilities with a Rototilt-equipped excavator are endless. Since 2006, Stroeder says the control systems on the Rototilts have continued to improve with more use-friendly features. From the original RT60 controls to prop plus and the new proportional controls on the R60 and R3 models, Stroeder says running a Rototilt has become even more fluid to run and easier for less experienced operators. The latest Rototilts are equipped with a next generation ICS control system that provides detailed settings pre-programmed for specific applications, and precision proportional controls. The ongoing system improvements have not gone unnoticed for Stroeder who appreciates upgrades to the control systems since those early days. In 2008 (and the global economic crisis), Pete Stroeder Contracting relocated from BC to the Ottawa area. He needed to make name for himself in this new area, but also in a new market because golf course construction had come to a halt and the recession meant work was scarce. Eight years later, the contractors Stroeder worked with in those early days have added multiple Rototilts to their fleet. “I really believe it you don’t have a Rototilt today, you’re going to need one to remain competitive,” he says.